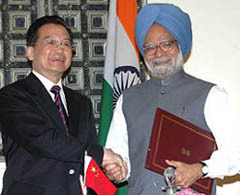 Describing Chinese Premier Wen Jiabao’s visit as “historic and outstanding,” India and China agreed today to upgrade their relationship to a “strategic and cooperative partnership for peace and prosperity” coupled with thrashing out 11 Articles setting the Political Parameters and Guiding Principles for settling the vexed boundary question. Should the Kalka-Shimla railway line be treated as national heritage? 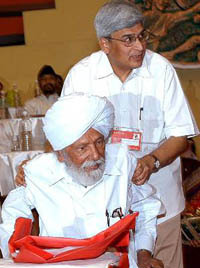 The CPM today elected party ideologue Prakash Karat as the new General Secretary bringing about a generational change in the party leadership. What can be done to tackle the rising crime in the country? We will be able to bring even closer our partnership. The legacy of former Agriculture Minister Surender Singh was passed on to his daughter Shruti towards the end of his rasam pagri held at the Bhim Stadium here today. The minister had been killed in a helicopter crash near Saharanpur in Uttar Pradesh along with Haryana Power Minister Om Parkash Jindal on March 31. A much embarrassed Bharatiya Janata Party today moved swiftly to control the damage caused by RSS chief K S Sudarshan’s observation made to a TV news channel that the BJP senior leaders L K Advani and former Prime Minister Atal Bihari Vajpayee should retire from active politics paving the way for younger leaders to take over the reins of the party. As many as 52 bodies have been recovered from the Narmada at Dharaji in Dewas district where a large number of persons had washed away on the night of April 7 following a sudden release of water into the river from the Indira Sagar Dam. The Supreme Court today issued notice to the Centre on a petition seeking the extension of reservation benefit to Dalit Christians, asking it to submit an affidavit on the issue. A Bench of Chief Justice R.C. Lahoti and Mr Justice G.P. Mathur, issued the notice on a petition alleging that the Dalits on conversion to Christianity were being denied the benefit of reservation available to the SC and ST people.